What comes into your mind when you think of handbell playing? A group of middle aged people practising change ringing, or perhaps the rather rude sketch on The Two Ronnies (available on YouTube)? 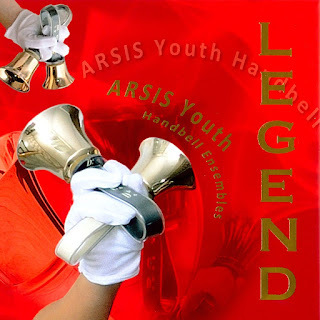 This disc, Legend from the Arsis Youth Handbell Ensemble is nothing like either of those. There are seventeen tracks by composers such as Albeniz, Tchaikovsky, Handel, Khachaturian, Brahms and Albinoni played by both the youth and senior ensembles conducted by Aivar Mäe. Handbell music in Estonia seems to be a relatively young culture, having been introduced in 1993 when the Arsis Handbell Ensemble was founded by conductor and artistic director Aivar Mäe. Today Arsis comprises and eight-member professional ensemble, four youth ensembles with 48 members and two schools. This disc showcases two of the youth ensembles. The bells that they play cover a wide range, with two sets of seven octaves from the biggest to the smallest. Playing music with a set of hand-bells requires a very particular technique as each note is formed from an individual bell thus requiring co-ordination between the players. Bells have a number of significant characteristics, their distinctive combination of harmonics and overtones and the relatively long reverberation. This means that the music has a lovely aura about it from the vibrating bells, and for really long notes the bells have to be re-struck thus giving a more pulsing feel. A feature of the fact that each note comes from a different bell as the the overall timbre and texture changes with pitch, this enables the composer or arranger to bring a remarkably variety into the sound world. To listen to this music is to enter another world, very much like the music for steel band used by Jeremy Deller for English Magic (which included a transcription of RVW's Fifth Symphony and a David Bowie song). On this disc the music becomes completely transformed by the new sound world. Perhaps an indication of future direction is that three of the pieces here are original compositions, L Gillis's delightfully up tempo Pick a Winner, M Helman's rather magical Nocturne, and KL Buckwater's surprisingly complex Valse le adieux. The disc ends with a pair of dances from Tchaikovsky's Nutcracker. Inevitably the bells lend themselves to the Dance of the Sugarplum Fairy but also to the Trepak. Not everyone will like this sounds conjured on the disc, and it is certainly a disc to dip into. But I have to confess myself entranced, and I have nothing but admiration for the technique and style which the young people bring to the pieces (the video below gives a fair indication of the sheer mechanics required for a performance).